Features are important to us at StorQuest Self Storage on Milgeo Ave. It’s what sets us apart from other self storage facilities in the area. We care about our tenants, which is why our features have been tailored to fit the needs of Ripon citizens. We know you’re busy and we know that traditional access hours of nine to five just won’t cut it. Everyone has a different schedule, and we want to make sure that you have access to your belongings when you need them. That is why we offer extended gate access hours from 7:00am to 9:00pm – everyday of the week. Because we are also security-conscious here at StorQuest Self Storage, our property is fenced and requires key-code access to enter. As an added security measure, we ask that all residents provide their own lock for their unit. Your lock, your key. Our 24-hour security cameras are always watching over your stuff. Don’t have a lock? You’re in luck. We sell locks, boxes, and packing supplies in the StorQuest Self Storage office, which is open Monday through Saturday from 9:00am to 5:00pm. For more information on the great features offered here at StorQuest Self Storage in Ripon, contact or visit us today. 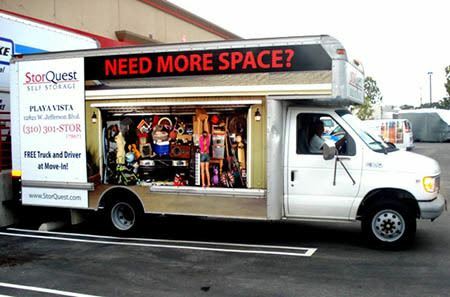 If you decide to store with us, we’ll even grant you access to our exclusive FREE truck and driver at move-in. StorQuest Self Storage is located on Milgeo Ave just off of Highway 99 in Ripon. You can find us opposite the ball fields of Ripon High School.